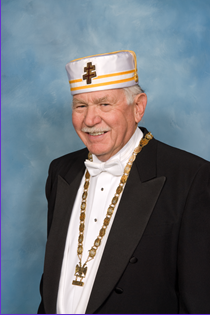 Many friends and brothers have asked why, midst all the successes we have seen at San Jose Scottish Rite, why in the world am I retiring. As most of you know, I’ve been planning and building a home in the Sierra Foothills, and last spring, Hazel and I moved into it. It is a lovely place, but, as a new residence, needs the attention of the owners to be completely satisfactory, and I just don’t feel I’m doing justice to Scottish Rite by living 140 miles from the center and trying to spend time on my new home . As much as I have enjoyed these past four years as your Personal Representative, I also enjoy the challenges of developing my new home and grounds. To try to cling to the job of Personal Representative, in my opinion, is presumptuous at best and selfish at worst. Also, to do justice to the position I have held these past four years requires anywhere from one to three or four days a week in San Jose, and life is too short to spend all my time on the road between San Jose and Sonora. In passing, I’d just like to tell all my friends how much I’ve enjoyed the chance to have spent the past four years as your Personal Representative. Of course, working with Illustrious Bill Stovall and the entire phalanx of officers and Personal Representatives at the state level has been a most interesting and rewarding experience, but the best part of all has been working with the members of San Jose Scottish Rite. To have been given a chance to work with the likes of Ill. Leo Mark, and then had the awesome assignment of taking over the reins of control from him and being a part of a team that has contributed what I consider to have been a terrific revitalization of interest and activity in both the affairs of the bodies and the foundation has been tremendously rewarding for me. I certainly feel I must have an angel on my shoulder, because whenever a serious problem presented itself, someone stepped in to solve it for me. Time and again our members took over the tough jobs and handled them flawlessly. Our General Secretary has been a godsend. My so-called Kitchen Kabinet has been my support group, think tank, committee chairmen, advisory board and close friends. They have kept the activity of the Valley running like a Swiss watch. The Office staff has handled the business of the foundation and the bodies exceptionally well, have interacted seamlessly with the Kabinet, and have relieved me of much, much detail work that I’m poorly prepared to attend to. The Clinic staff members have outperformed all expectations and have been the envy of the fourteen other clinics in California. The maintenance staff members have kept the building together and functioning under the watchful eye of Bob Rowan, and at sundown have miraculously transformed themselves into a serving team under the direction of the incomparable Angela Athans. Together we have tried to bring the policies and affairs of the organization into line with the expectations of the membership, and the membership has responded with alacrity and perspicacity (I couldn’t leave without using that line in one of my messages). There is still work to be done, but in any dynamic organization there will always be work to be done. In talking to Illustrious Ken Nagel, I find that he has some new and exciting ideas that will lend new interest and direction to the valley that I think will be most rewarding. My thanks to all who have contributed so much to the success of the Valley for the duration of my term, and I trust that the future will bring more and more rewards to your efforts.